Rock stars REM have become the first band to play before a vast new curtain at Cardiff's Millennium Stadium which turns the venue into a smaller arena. The American band played on Sunday to 35,000 people, which is half the stadium's usual full capacity. The 1,100 kg black curtain suspended from the roof cuts the stadium "bowl" to allow it to stage events for as few as 12,000 spectators. It makes the stadium the biggest indoor venue of its kind in Europe. Stadium chiefs hope the £1m investment will allow it to attract a larger variety of events and groups. 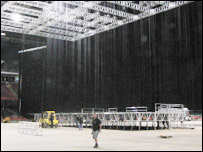 Not all bands are as popular as U2, who sold 60,000 tickets at the stadium in June, and the new "grid and drape" system means the curtain can be shifted to four different positions for up to 46,000 fans. 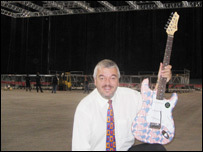 Stadium manager Paul Sergeant said it meant the venue could complement rather than compete with the nearby 7,500-capacity Cardiff International Arena. Mr Sergeant also hopes it will help fill the stadium's diary when the FA Cup and other major football games return to the rebuilt Wembley in 2006. Since the Millennium Stadium opened in Cardiff city centre in 1999 it has staged nearly 200 events, of which 37 would have been at Wembley. "I'm often asked 'is there life after the events return to Wembley?' " said Mr Sergeant. "This week will show that there is." He said one advantage of the new system was that it allowed to acts to set up and leave the stadium very quickly. In theory, a rugby game could be played one day and an arena show the next day, although that is unlikely. The long-term planning involved in major events means that REM are likely to be the only band this year to play the venue billed as "The Arena at the Millennium Stadium". The stadium hopes to attract a variety of events to the arena, ranging from jazz and classical concerts, tennis and boxing, ice skating, award ceremonies and conferences. The £1m cost is funded by the stadium, the Millennium Commission, caterers Letherby and Christopher and the Wales Tourist Board. Although REM cancelled Saturday's show in Hyde Park, London, after the bombing attacks, Mr Sergeant said there was never any question over Sunday's Cardiff gig.